휴, 베트남의 Hue Serene Shining Hotel & Spa - Hostelworld.com에서 저렴한 호스텔과 숙박시설을 찾아보세요. Located in the heart of the historic city of Hue ,Serene Shining Hotel is a tranquil sanctuary for the mind, body and soul. 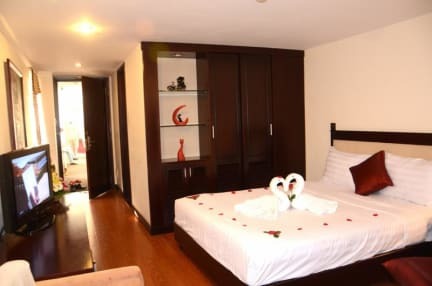 The modern building nestles in a quiet alley, just a stone's throw away from Hue's main attractions including Trang Tien Bridge, Huong River and the famous Hue Imperial City. 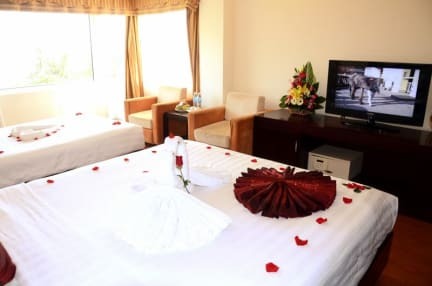 The 24 fully-furnished rooms at Serene Shining Hotel are equipped with modern facilities and amenities to provide guests with the most comfortable stay. Enjoy our on-site restaurant, bar and spa, or stroll down the street to find all of Hue ’s top attractions at your fingertips. Whether you’re looking to explore ancient tombs and houses or watch the world pass by in a quaint riverside café, all experiences are just outside your door.